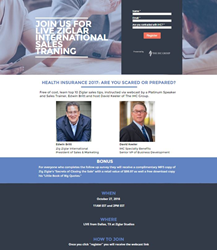 With national projections forecasting that a large number of Americans will be forced to find new coverage, the opportunities expand for health insurance advisors to attract new business.That dynamic intensifies the importance of the IHC/ZZI live webcast. The IHC Group (IHC) announced today a live webcast with Zig Ziglar International (ZZI), to motivate thousands of health insurance advisors as they prepare for the upcoming 2017 Obamacare open enrollment, which is set to begin in just 10 days on Nov. 1, 2016. The webcast will also introduce IHC’s new fixed indemnity product, Care Access Plan. At least 1.4 million people in 32 states in 2017 will lose the Obamacare plan they have now, according to a recent report from Bloomberg. ** With national projections forecasting that a large number of Americans will be forced to find new coverage, the opportunities expand for health insurance advisors to attract new business. That dynamic intensifies the importance of the IHC/ZZI alliance, which seeks to implement best-in-practice sales strategies to give health insurance advisors an edge on their competition. This unprecedented and dynamic webcast will air live from the headquarters of ZZI in Dallas, Texas, on Oct. 27 with two time-slot options for attendees, one at 11:00 a.m. and the other at 2:00 p.m. EST. For more information on the live webcast, or to register for the event, please visit http://unbouncepages.com/ziglarihc-webcast. *”Advisor” – as used herein also includes licensed health insurance producers. Independence Holding Company (NYSE: IHC) is a holding company that is principally engaged in underwriting, administering and/or distributing group and individual disability, specialty and supplemental health, pet, and life insurance through its subsidiaries since 1980. The IHC Group owns three insurance companies (Standard Security Life Insurance Company of New York, Madison National Life Insurance Company, Inc. and Independence American Insurance Company) and IHC Specialty Benefits, Inc., which is a technology-driven insurance sales and marketing company that creates value for insurance producers, carriers and consumers (both individuals and small businesses) through a suite of proprietary tools and products (including ACA plans and small group medical stop-loss). All products are placed with highly rated carriers. “IHC” and “The IHC Group” are the brand names for plans, products and services provided by one or more of the subsidiaries and affiliate member companies of The IHC Group (“IHC Entities”). Plans, products and services are solely and only provided by one or more IHC Entities specified on the plan, product or service contract, not The IHC Group. Not all plans, products and services are available in each state. Zig Ziglar International (ZZI) builds champions by taking the time-tested knowledge of Zig Ziglar to create your transformational journey. Zig Ziglar, was the most prolific and catalytic salesman, leadership trainer and motivator for generations, influencing more than 250 billion people during his lifetime. He founded the Zig Ziglar Corporation in 1977 and ended up authoring 33 books, including the bestseller See You at the Top, which has sold nearly two million copies.